It’s not often we get asked to look at a flat roof as large as this and unfortunately our free estimate wont cover the cost of surveying this roof and reporting back the findings. 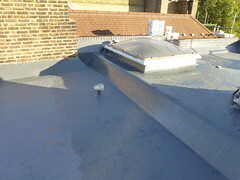 This flat roof is a round 1500m2 and is covered with an old type flat roofing membrane with welded joints, this type of roof is still being fitted but we consider it to be one of the older generation flat roofing materials. I’ve taken a walk around the inside of he building and seen where the water is penetrating, externally I have examined the roof and can see lots of design faults, I will be submitting a preliminary report suggesting that thermal imaging of the roof is undertaken to show where the insulation is saturated this will help identify the areas of the roof where the roof has taken on water, then we can scrutinise each joint and visually inspect the membrane for holes punchers or rips. At this stage I think we will be cutting out all the wet insulation then repairing the roof using a liquid roofing systems such as GacoRoof. Maintenance of pipes, guttering roofing gullies were all general items that had to be looked at cleaned and maintained on a regular basis thought the year when I first started working on properties. Unfortunately with the cutbacks and the lack of intrest some people have in there property these things just dont get maintained. We find that the best policy to have when managing a large block of flat is to have a good routine maintenance schedule. When It come to making claims on the insurance of the block, being able to prove that maintenance was kept up can be an advantage. 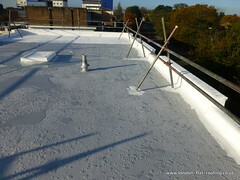 We have just covered an old asphalt roof in wembley with the new liquid waterproofing system, we dressed the parapet walls with the system so we didn’t have any flashing details to deal with. Cracking is evident and the ceiling below shows water-damage. The brick parapet wall is solid construction but the flat roof is built on timber and will settle over time, the asphalt will melt in the summer and go brittle in the winter, with the thermal movement the cracking occurs. So after cleaning of the roof taped patches are applied to the cracks before the new roofing system is installed to the roof. On this roof we are using the GacoRoof a silicon-based liquid roofing materials from the USA . GacoRoof is very flexible and can withstand the movement described above. We are on day to of this roof, the old roof is an old asphalt roof and was leaking from several places. In this video I walk you around the roof showing you the condition of the old roof, some of the cracks and detailing. 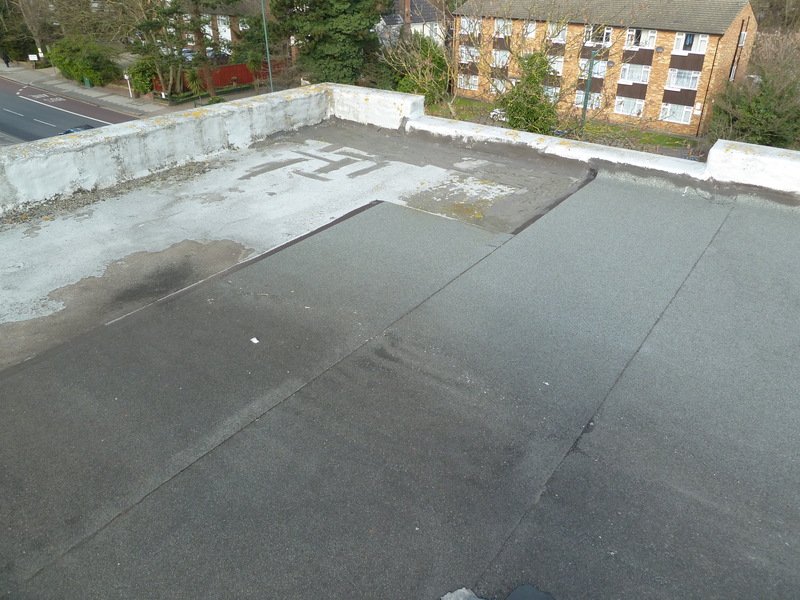 Before we cover the old flat roof with the new roofing system we have given it a good clean and repaired all the damage that has happened over the years. This old roof had Ponding or pooling water all down the center, although a problem to the old roof its not a problem to the new liquid silicon roof. Green flat roofs may be nice on the environment and nice to look at but when you get a problem they can be very expensive. This green flat roof is probably going to have to be completely striped as the flat roofing membrane under it is leaking somewhere and we cannot find the problem. Realistically under a green flat roof you don’t want to have joints that can go wrong at sometime, most new flat roofing materials will last for many years but when they do go wrong they will alway go wrong where there is details. Remove the details remove the problem.